Jenn and I are thrilled about our new Rifle Paper Co. iPhone cases! AFHny had a fun happy hour at Lomography. Jenn hosted the cutest ever tea party. We drank gallons of tea (with bourbon and gin, of course), ate delicious snacks (including dainty scones and cucumber sandwiches), and had lots of fun lady chit chat. The backyard was a little chilly for our sundresses (required attire) but we had a blast. Look out for a post by Jenn about all the adorable details. Eat your heart out, Martha. The slightly chilly but sunny weather was perfect for a long run in Prospect Park. I've never done two laps before! I also broke my bike out this weekend. I got it tuned up at the bike shop and took it for a quick spin one evening. Warm up, Spring! I'm ready for more biking! This weekend was Auburn's A-Day game (spring scrimmage) and the last rolling of Toomer's Corner before they have to cut the trees down :( Sadly, it's the end of an era, but I'm happy to see such an outpouring of support from the Auburn family. War Eagle! Looks like you had a great weekend, complete with sunny weather! I got a Rifle Paper Co. iPhone case too, I chose the "Botanical Rose". It was so hard deciding, because I love them all! That Lomography shop looks so awesome, I've only seen their cameras at Urban Outfitters. It WAS so hard to choose a phone case! They are all so pretty! Your tea party looked like so much fun!!! I love that y'all wore sundresses. So sad about Toomer's. We ended up not going because we are going down next weekend, but I was amazed by how many people were there from the pictures. The tea party was great. If you ever need an excuse to get a bunch of ladies together, I highly recommend it. 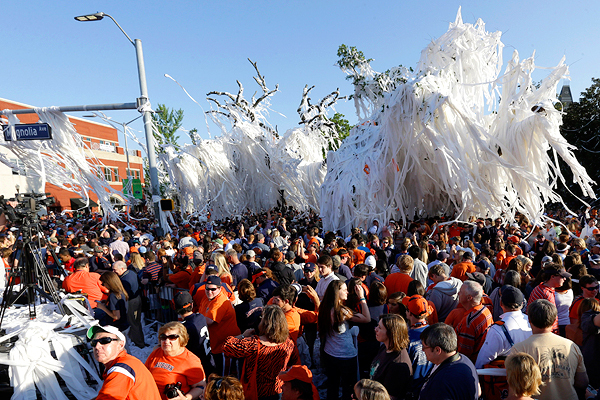 So sad for Toomers :( It will be so weird to go back to Auburn and not see those trees! Fun weekend! I'm obsessed with the Rifle Paper Co. cases too! I just adore that company! Rifle Paper seriously has the cutest stuff. I don't know how that lady does it! You are too sweet, Shoko! It was a great weekend!